As you prepare for Thanksgiving, be sure to include healthy food choices. Don’t forget about the spices with your feast-cinnamon, rosemary, ginger, oregano, red peppers, thyme, and turmeric. Guess what, they all have health benefits for mind and body. Cinnamon-This is so simple to add into your foods or beverages. Add it to your sweet potatoes, coffee, cranberries, or pumpkin pie. Cinnamon is believed to help regulate blood sugar levels and possibly help lower cholesterol levels. Rosemary-Add rosemary to your potatoes, rub on the turkey, add to vegetables. This spice is good for your memory and is believed to aid in reducing inflammation. Rosemary is full of minerals and vitamins. Ginger-Flavor your pumpkin pie with ginger, bake ginger cookies, add ginger to your sweet potatoes. Ginger has been shown to help you feel better if you’re feeling queasy! Try taking a piece of fresh ginger in hot water and wow you have freshly brewed ginger tea. It’s delicious! Oregano-Add oregano to your stuffing or to your vegetables. Oregano contains high amounts of antioxidants and is packed with flavor! Red peppers-Red peppers have been shown to increase metabolism. Need I say more? Put it in your salad, add to your vegetables or stuffing. Use your imagination-the sky is the limit! Thyme-Try adding fresh thyme to your stuffing or as part of a rub for turkey or other poultry. Thyme is another spice with antioxidant properties. It’s also delicious in a salad. Turmeric-Turmeric is believed to have anti-cancer properties, promote healthy hearts, and have anti-aging properties as well. Studies are ongoing to determine if there is a link between turmeric and a decreased risk of developing Alzheimer’s Disease. Turmeric is found in curry powder, so try some curry chicken. Turmeric can be added to vegetables, rice or potatoes. So, as you prepare your Thanksgiving feast, take a close look at your recipes and determine where you can add these spices. After Thanksgiving, try to add these spices to your everyday cooking. Why not make a concerted effort to eat healthy and promote healthy aging while enjoying healthy living? Happy Thanksgiving! To your health! Do you know your family health history? If not, I suggest you research and record your family health historyduring Thanksgiving. Since we gather together with our families during the holiday season, it’s an excellent time to get your family health history. Do you have a family history of Alzheimer’s Disease, dementia, heart disease, stroke, Parkinson’s Disease, high blood pressure, diabetes, cancer, thyroid disease, or any other chronic disease? Did you know that with any of these diseases you have an increased risk for developing memory problems and other cognitive deficits? By doing a little research into your genes, you have the ability to map out a more healthy lifestyle. It’s never too late to make positive lifestyle choices whether you’re a senior, a baby boomer, in your 40’s or 30’s, or in college. Find out the age of your oldest living blood relative. By the way, mine was 114, 115, or 116. I find that truly amazing! Try to brainstorm as a family what this relative did to achieve such healthy aging and longevity. Don’t be surprised to discover that these people probably have some things in common. They were active and kept moving, stayed engaged and connected with people, and consumed a healthy diet. No junk food or fast food on a regular basis. Strive for that kind of lifestyle to achieve optimal health. Don’t forget to include regular exercise as a part of a healthy lifestyle! Why not take advantage of every possibility to lessen your chances of developing memory loss or suffering a cognitive decline? Remember, memory loss does not have to be a part of the normal aging process! Be in command of your health and your life! So, take charge of your health! Engage your brain with challenging and fun brain fitness activities. Let’s build your cognitive reserve through some mentally stimulating activities. Learn a new game, learn a new language, participate in a social group, and EXERCISE! Try our Brain Boosters! One of the secrets to longevity is to achieve a healthy balance between a healthy mind, body, and spirit! Let us know the age of your oldest relative, too! Happy Thanksgiving! Now is the time for YOU commit to your health! Here are some exciting and upcoming October events for BrainMasters. We challenge you to exercise your brain! Will you accept the challenge? Remember, we are never too old to engage in new learning. Contact us to schedule your classes at your convenience. See you soon! Well, it’s hard to believe it’s already September! Summer is essentially gone, and now we’re all back to school. Some of you may even be planning your family holiday vacations. Remember to always schedule time for your health, both physical and mental exercise. Speaking of exercise, it’s time to exercise your brain, form new brain pathways, build your cognitive reserve, challenge yourself, engage in new learning! Become a lifelong learner, and take advantage of your brain or neuroplasticity skills through new learning. We are never too old for new learning or too young to begin building our cognitive reserves! Let’s try some anagrams today. Create as many new words as you can from the following words. Go grab a healthy snack-blueberries, apples, walnuts, almonds, veggie sticks, dark chocolate, paired with a healthy beverage-green tea, water, red wine. I just had some walnuts and peach green tea. Ready? Remember to exercise your body as well! Physical exercise helps pump blood throughout your body-including your brain. Studies have shown that by walking just 35 minutes a day at least 3 days/week it’s possible to increase the size of your hippocampus, which may correlate to improved memory skills! So, get up, leash that dog and take a walk! Be sure to drink plenty of water, too! Your brain and body need water for optimal function. Here’s to your health! Have You Had Your Brain Food Today? As you prepare your meals, be sure to include healthy food choices. Don’t forget about the spices-cinnamon, rosemary, ginger, oregano, red peppers, thyme, and turmeric. Guess what, they all have health benefits for mind and body. Rosemary-Add rosemary to your potatoes, rub it on meats, add to vegetables. This spice is good for your memory and is believed to aid in reducing inflammation. Rosemary is full of minerals and vitamins. Ginger-Flavor pumpkin pie with ginger, bake ginger cookies, add ginger to your sweet potatoes. Ginger has been shown to help you feel better if you’re feeling queasy! Try taking a piece of fresh ginger in hot water and wow you have freshly brewed ginger tea. It’s delicious! Oregano-Add oregano to pizza, Italian foods or vegetables. Oregano contains high amounts of antioxidants and is packed with flavor! Red peppers-Red peppers have been shown to increase metabolism. Need I say more? Put it in your salad, add to your vegetables or rice. Use your imagination-the sky is the limit! Thyme-Try adding fresh thyme to vegetables or as part of a rub for turkey or chicken. Thyme is another spice with antioxidant properties. It’s also delicious in a salad. So, as you prepare your daily meals, take a close look at your recipes and determine where you can add these spices. Try to add these spices to your everyday cooking. Why not make a concerted effort to eat healthy and promote healthy aging while enjoying healthy living? 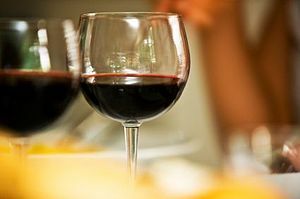 Here’s to your brain health! Enjoy a brief clip from a BrainMasters class at the Parc Alpharetta. Watch as we engage our participants in a Brain Booster designed to address immediate and short term memory skills. What could be better than strengthening your memory skills while having fun? Enjoy a brief clip from a BrainMasters class at the Parc Alpharetta. These participants definitely had fun while exercising their brains! This Brain Booster addresses thought organization, problem solving, and thought flexibility skills. 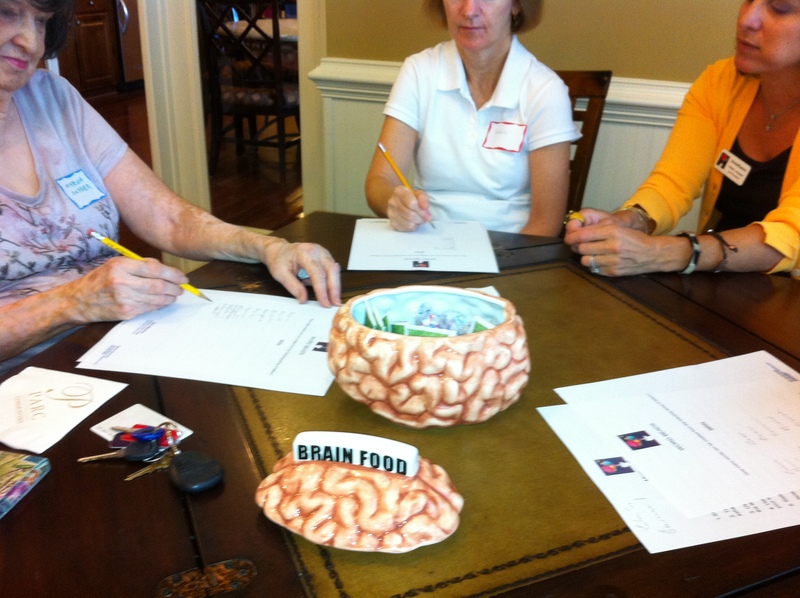 Enjoy a brief clip from a BrainMasters class at the Parc Alpharetta. We love to exercise the brain while having fun! These participants definitely had fun while giving their brains a workout! Well, it’s hard to believe it’s already June! Summer is here, and now we’re all planning and taking our family vacations. Remember to schedule time for your health, both physical and mental exercise. Speaking of exercise, it’s time to exercise your brain, form new brain pathways, build your cognitive reserve, challenge yourself, engage in new learning! Become a lifelong learner, and take advantage of your brain or neuroplasticity skills through new learning. We are never too old for new learning or too young to begin building our cognitive reserves! Let’s try some anagrams today. Create as many new words as you can from the following words. Go grab a healthy snack-blueberries, apples, walnuts, almonds, veggie sticks, dark chocolate, paired with a healthy beverage-green tea, water, red wine. I just had some walnuts and peach green tea. Ready? Here are your June inspired words.